Ed. by I. V. Perminova, K. Hatfield, N. Hertkorn et al. Effective remediation of polluted environments is a priority in both Eastern and Western countries. In the U.S. and Europe, remediation costs generally exceed the net economic value of the land. As a result, scientists and engineers on both sides of the Atlantic have aggressively tried to develop novel technologies to meet regulatory standards at a fraction of the costs. In situ remediation shows considerable promise from both technical and economic perspectives. In situ technologies that deploy natural attenuating agents such as humic substances (HS) may be even more cost effective. Numerous studies have shown humics capable of altering both the chemical and the physical speciation of the ecotoxicants and in turn attenuate potential adverse environmental repercussions. Furthermore, the reserves of inexpensive humic materials are immense. Which suggests HS portend great promise as inexpensive amendments to mitigate the environmental impacts of ecotoxicants and as active agents in remediation. To elucidate emerging concepts of humics-based remediation technologies, we organized the NATO Advanced Research Workshop (ARW), entitled "Use of humates to remediate polluted environments: from theory to practice", held on September 23-29, 2002 in Zvenigorod, Russia (see the web-site http://www.mgumus.chem.msu.ru/arw). Preface. Introduction. Contributors. Part 1. 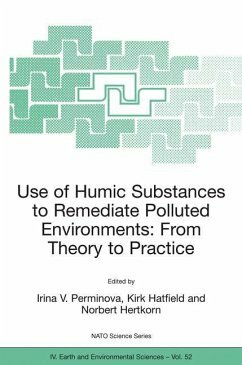 Remedial properties of humic substances: general considerations and problems in addressing needs of environmental remediation. 1. Remediation chemistry of humic substances: theory and implications for technology; I.V. Perminova, K. Hatfield. 2. Soil organic matter and protective functions of humic substances in the biosphere; D.S. Orlov and L.K. Sadovnikova. 3. Chemical stoichiometry and molecular level mechanisms as support for future predictive engineering calculations, D.S. Gamble et al. Part 2. Complexing interactions of humic substances with heavy metals and radionuclides and their remedial implementation. 4. Interactions of humic substances with trace metals and their stimulatory effects on plant growth; A. Kaschl, Y. Chen. 5. Influence of UV-oxidation on the metal complexing properties of NOM; F.H. Frimmel et al. 6. Role of humic substances in the complexation and detoxification of heavy metals: case study of the Dnieper reservoirs; P.N. Linnik, T.A. Vasilchuk. 7. Complexation of radionuclides with humic substances; V. Moulin. 8. Humic acids as barriers in actinide migration in the environment; S.N. Kalmykov et al. 9. The use of humates for detoxification of soils contaminated with heavy metals; O.S. Bezuglova, A.V. Shestopalov. Part 3. Sorptive-partitioning interactions of humic substances with organic ecotoxicants and their implementation for remediation technologies. 10. Utilization of immobilized humic organic matter for in-situ subsurface remediation; G.U. Balcke et al. 11. The use of aqueous humic substances for in-situ remediation of contaminated aquifers; D.R. Van Stempvoort et al. 12. Advantages of in situ remediation of polluted soil and practical problems encountered during its performance; J.F. De Kreuk. 13. Wastewater treatment using modified natural zeolites; P. Princz et al. Part 4. Impact on physiological functions of living organisms and on microbial transformations ofecotoxicants. 14. Mitigating activity of humic substances: direct influence on biota; N.A. Kulikova et al. 15. Cytogenetic effects of humic substances and their use for remediation of polluted environments; A. Gorova et al. 16. Influence of metal ions on the activity of soil humics-enzyme complexes; S. Jorobekova et al. 17. Microbial redox reactions mediated by humus and structurally related quinines; J. A. Field, F.J. Cervantes. 18. Enhanced humification of TNT; H. Thomas, A. Gerth. 19. Commercial humates from coal and their influence on soil properties and initial plant development; O.S. Iakimenko. 20. Impact of humic substances on plants in polluted environments: implications for phytoremediation technologies; M.M. Kharitonov et al. Part 5. Quantifying structure and properties of humic substances and example studies on design of humic materials of the desired properties. 21. Molecular level structural analysis of natural organic matter and of humic substances by multinuclear and higher dimensional NMR spectroscopy; N. Hertkorn, A. Kettrup. 22. Understanding capillary electrophoretic separation processes to characterize humic substances and their interactions with pollutants; Ph. Schmitt-Kopplin, A. Kettrup. 23. Ozone application for modification of humates and lignins; M.M. Ksenofontova et al. 24. Synthesis, metal-binding properties and detoxifying ability of sulfonated humic acids; M.V. Yudov et al. Author Index. Subject Index.